Thanks Jennifer, I've been concepting on these for some time; it's nice to see them finished. Wishing you well and hope that you have a good day! Thank you for your order, I saw that; I'm going to refund your shipping since you're an avid blog follower - thanks again, I'll get them done and out very soon. 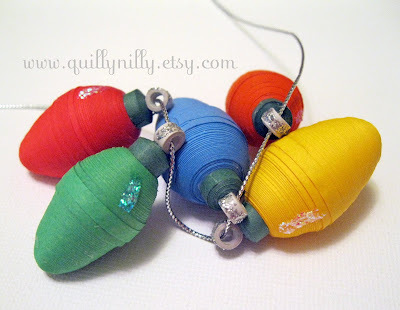 Love these quilled bulbs , you come up with the greatest quilling ideas! Thank you so much, I try to be original with most of my items. These look so festive and bright. Great job! I don't know how you get such uniformity in your 3D work. Well crafted! I have them hanging across a bulletin board in my studio area so I can see the lovely colors every day! :<) It is an inspiration as I learn this craft! Beautiful work - you are so skilled in this art form! Thank you! Barbara, so glad you like them; and thank you for the kind words. Have a fabulous weekend. Just checking in and saying hello! I am so behind with my visiting but wanted to say hello and wish you a happy day! This is SO adorable! Great idea, I should make some! Over the computer monitor-genius! That would insure I'd see them a lot, LOL *sigh*.